Social media ad buys are kind of crazy. 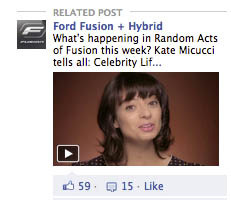 Take in point this ad for the new Ford Fusion Random Acts of Fusion campaign from Ford that showed up in my Facebook Home page newsfeed. 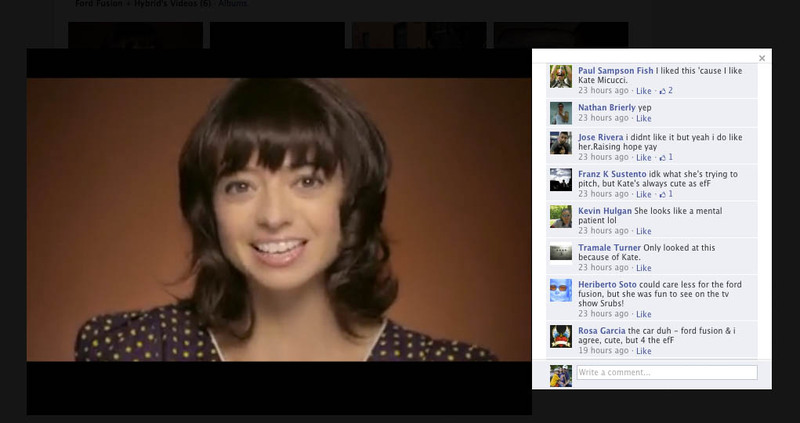 It has a visually interesting video still image of the actress Kate Micucci. How is her last name pronounced? I tried to say it to my wife and got slapped. Personally I had no idea who she was, but that says more about my lack of TV watching than it does about the choice to use her in the automotive ad. It's more interesting to use a celebrity, especially an attractive one than always going with another beauty shot of a car. What's interesting though is what happens with the ad's engagement. Do people like it for the car, the brand, or the actress? Based on the comments it is highly likely the ad gets its engagement less from being automotive than being cute celebrity content. However that really doesn't matter in the end, because people engaged with the brand in some way today that probably would have never happened if it wasn't for the nice photo of Kate and bonus if they clicked the video to see what she had to say. Obviously the focus here is generating awareness for the campaign to people who probably are not car people. What do you think? Does it matter what generates a like or a comment on an ad? channels from the ground up to benefit consumers and our marketing partners. and we will pay you, it really is that simple! repair facility by credit card, which again makes all parties happy. we offer at Drive Protected for VPP’s is unmatched! already done your part in establishing a high quality website! I think there needs to be a combination of content and a way to get people to watch the ad. Having Kate Micucci will draw people to watch the ad, but if the content in not memorable in the commercial then there is no reason to make it in the first place. On the other hand, if there is just content in a commercial and no way to draw people in, then the commercial is a lot less likely to be view by a lot of people making the commercial again worthless. Micucci is also one part of a duet, Garfunkel and Oates. It would be funny to see the two singing for a used car dealership in N. Thanks for the article, btw.